Craig Buckley completed his MA at the University of Western Ontario, attended the Whitney Independent Study Program in New York, and received his PhD from Princeton University in 2013. Before coming to Yale, he taught at the Graduate School of Architecture, Planning and Preservation at Columbia University. His research interests center on the history of modern architecture and the experiments of the historical avant-gardes, the publishing and media practices of architects, as well as the relationships between artistic and architectural movements through the course of the twentieth century. He is the editor of Dan Graham’s New Jersey, (Lars Müller Publishers, 2012), Utopie: Texts and Projects 1967-1978(Semiotext(e)/MIT Press, 2011), and Clip/Stamp/Fold: The Radical Architecture of Little Magazines 196X-197X (ACTAR, 2010). His writing and criticism have appeared in journals such as October, Grey Room, Log, and Perspecta, among others. 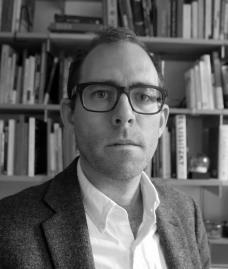 He is currently at work on a book project entitled The Architecture of Montage: Image, Assembly, and Print Culture in Postwar Europe which analyzes the legacy of montage and collage in the redefinition of techniques of assembly across a range of architectural practices in Europe from the 1950s to the 1970s. “Never Demolish: Bois-le-Prêtre Regrows in Paris,” Log 24 (Winter/Spring 2012), 43-50. “The Echo of Utopia,” Utopie: Texts and Projects 1967-1978, (Semiotext(e)/MIT Press 2011), 9-28. “Landscapes without Cultural Precedent: Tony Smith’s Urban Visions” Perspecta 44 (Fall 2011), 70-85. “Graphic Constructions: The Experimental Typography of Edward Wright,” October 136 (Spring 2011), 156-181. “From Absolute to Everything: Taking Possession in Alles ist Architektur,” Grey Room28 (Summer 2007) 108-122.